Magritek have launched a series of short videos that illustrate the convenience, power, and ease of use of their Spinsolve benchtop NMR spectrometer. Giving undergraduates the opportunity to get hands-on use of advanced analytical tools such as NMR is a driver for the analytical instrument industry. Benchtop mass spectrometers are now well accepted and the last two years have witnessed the take-off of NMR systems like the Magritek Spinsolve, the fastest benchtop NMR spectrometer. In past years, NMR has been a technique restricted to specially equipped laboratories with highly trained operators. With the advent of new magnet technology (Blümich et al, RWTH Aachen University), it is now possible to have a system operating without cryogens or a special lab; a single power socket is the only requirement to be operative. With the system being so compact, it may be readily put on a trolley and moved from lab to lab to reach students at all levels of their undergraduate course. Flexibility to be able to move Spinsolve to the fume cupboard opens up new possibilities for convenient flow-through reaction monitoring studies (Cronin et al, Glasgow University & Maiwald et al, BAM Institute, Berlin). Magritek have now launched a series of short videos to illustrate how straightforward it is for users with minimal instruction to carry out their own measurements in minutes enabling undergraduates to confirm their synthesised products are indeed what they set out to produce. More and more labs are reporting excellent results and positive experiences from their students. This is illustrated in a video where University of Queensland lecturer and teaching enthusiast, Dr Philip Sharpe, describes his experiences bringing Spinsolve into his laboratory practical classes. The first four videos may be viewed on our Spinsolve video page. These cover the basics of the Spinsolve, subjects like ease of use and system sensitivity, features most important to new users to help establish the use of NMR technology. With lab groups comprising twenty or thirty students, throughput is also important. 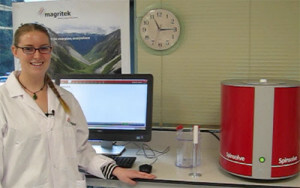 Magritek applications specialist, Sarah Moore, demonstrates running ten samples in just five minutes. In the fourth video, Sarah demonstrates the ability to perform multinuclear experiments with Spinsolve is illustrated in an example switching between hydrogen and fluorine nuclei, an experiment of particular interest in pharmaceuticals.